The USDA's Grain Stocks report backed up corn forecasts, but surprised with its soybean data. 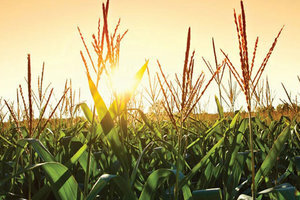 According to a recent news release highlighting findings from the U.S. Department of Agriculture’s National Agricultural Statistics Service’s (NASS) “Grain Stocks” report, corn stocks are up and soybean stocks are down when compared to a year ago. The collected data shows there were 1.24 billion bushels of old crop corn in all positions as of September 1, up 50% from the same time last year. Of the total stocks, 462 million bushels of corn were stored on farms (up 68%) and 774 million bushels were stored off the farm (up 42%), both representing substantial increases from 2013. The U.S. corn disappearance totaled 2.62 billion bushels during June-August, up from 1.95 billion bushels during the same period last year. The Grain Stocks report also reported that there were 92.0 million bushels of old crop soybeans in storage, a 35% drop from a year ago. Of this total, 21.3 million bushels were stored on farms and 70.6 million bushels were stored off the farm, up 46% and 30% respectively, compared to last September. The U.S. soybean disappearance during June-August totaled 313 million bushels, up 6 percent from the same period last year. While the corn numbers release by the USDA remained consistent with previous expectations, the soybean report came as a surprise to many. A Farm Futures article notes soybean futures turned higher after the data released in the report fell short of many trade forecasts. In addition to the Grain Stocks report, the USDA has also released the Small Grains 2014 Summary, which included the final tallies for U.S. wheat, oats and other small grains.